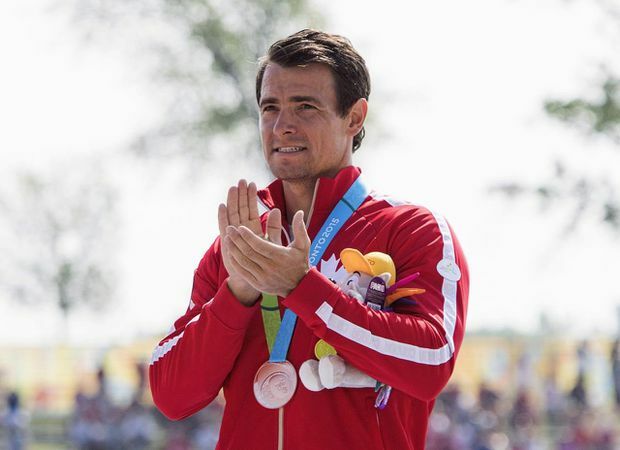 Canada's Adam van Koeverden accepts his bronze medal for the K1 1000m final at the 2015 Pan Am Games in Welland, Ont., on July 13, 2015. Former Olympic flag-bearer Adam van Koeverden will be carrying the Liberal banner into the coming federal election, after securing the nomination in the southern Ontario riding of Milton on Sunday. A website laying out the details of van Koeverden’s candidacy says his campaign will focus on traditional Liberal values with an emphasis on youth, sport, physical education and healthy communities. His nomination was not without controversy, as the party’s 2015 candidate, Azim Rizvee, claimed that Prime Minister Justin Trudeau pushed him to resign. “Prime Minister Justin Trudeau personally told me and my wife very aggressively that Adam van Koeverden is his preferred candidate for the Milton riding,” Rizvee said in a statement Saturday. A spokesman for the Liberals said the Milton nomination was held in accordance with the party’s nomination rules, and more than 800 Liberal members turned out to vote. Braeden Caley declined to provide a breakdown of the results, but said the other nomination candidate was Mian Abubaqr, the president of the Milton riding association.